Tonight, as the cold air blew into town (what’s up with that, anyway?) so too did the crowds into Chelsea. I’m not sure I’ve ever seen Chelsea so crowded. 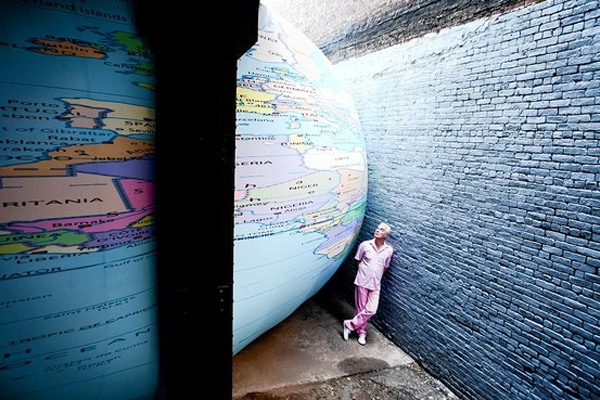 Part of the attraction was the opening of David Byrne’s installation, Tight Spot, the huge inflated globe squeezed in under the High Line. Byrne was there himself, looking tan and chipper, while we listened to his very deep, bass, pre-recorded distorted vocal sounds emanating from the globe. Next door in the Pace gallery itself, was the opening of the show Social Media. Among the interesting pieces (in all honestly, it was a little too crowded to appreciate in its entirety) I really enjoyed Christopher Baker’s Murmur Study and Penelope Umbrico’s Sideways TVs. The Murmur Study is instantly engaging and fun with all its ticker-tape spewing live Twitter status updates from twenty thermal printers attached to the gallery walls. Sideways TVs by Penelope Umbrico made me chuckle. A large collection of miniature photos nicely hung separated from the wall and all displaying a collection of outdated TV monitors. Impressive how those things have trimmed down in the past few years. There is plenty more to see at the Pace show and all the other galleries as well. Looks like the fall is here to stay and, just like that, another season of Chelsea art shows has begun. Tight Spot will be on exhibit through October 1st, and Social Media runs through October 15th.